Congratulations to all at Old Hall Farm, Woodton on their excellent raw Jersey milk which is delicious and their fantastic bacon and sausages! You can buy Norfolk Scrumpers Apple juice from the farm shop too and bread from Hempnall Bakery! The team at Norfolk Scrumpers is working hard to get ready for the first pressing of 2017! We are upgrading our circulating pumps to improve our pasteuriser so we use less wood and are even more sustainable! We anticipate a busy year, so please get in touch to book your apples in! 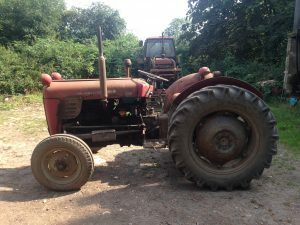 My new (old) FE35 is about to be insured for use in the orchard and for loading pallets. No more wheelbarrowing your apples to and from the press shed; the plan is to get some wooden apple crates and build some lids, so we can unload your vehichle straight into the crates and take them to the press with the tractor. Some minor repairs to do, but she’s a good old thing and we’re calling her Gerty. All the new apple trees in the Lundy Green orchard have been pruned, I just need to get the mypex up and do some brushcutting and I gan get some photos up. I have also begun a three-year pruning job to tackle an overgrown Bramley in Tasburgh which is one of the largest and oldest I have seen. Regenerative pruning on such an old tree needs to be taken slowly to avoid “water shoots” – an attempt by the tree to rapidly redress an imbalance between roots and shoots caused by heavy pruning, these shoots grow straight upwards and do not produce flowers or fruit. By making no more than 25% of the pruning cuts needed in one season, it is possible to minimise this reaction from the tree. Maybe next winter I’l get time to prune the two Bramleys in my own garden which always get neglected and left until it’s too late! Juice available to buy online! We are proud to announce that you can now buy our juice online at https://www.hempnallbakery.co.uk you may also buy bread and honey and we offer free local delivery to Hempnall and surrounding villages (and other places where Kristian and Dan work or visit regularly, please email if you need to know if we can deliver for free). You may also order and pay through the website then collect from us in Hempnall. At last, some rain and an opportunity for the trees to swell those apples which remain! Let’s hope there is some picking weather on the way next. If you want the best juice like we do, there are a few steps you can take to get the best from your apples. Picked apples are better than windfalls, they have never touched the floor and have not been bruised. Windfalls may need washing if dirty and any bruised or gouged apples should be discarded if they are not going to be pressed immediately as they can begin to rot. Apples are best stored in hessian sacks (available from us for £1 deposit per sack), paper feed sacks or strong carboard boxes (preferably stackable). Apples which remain on the tree for longer generally produce sweeter juice. If you cannot find suitable containers, you are welcome to transfer your apples into our hessian sacks when you drop them off but we do get very busy so it is best if you can pick straight into a suitable container. This is also better for the apples as there is less handling. After having our pumps serviced and our equipment deep-cleaned, we are about to begin pressing next week. 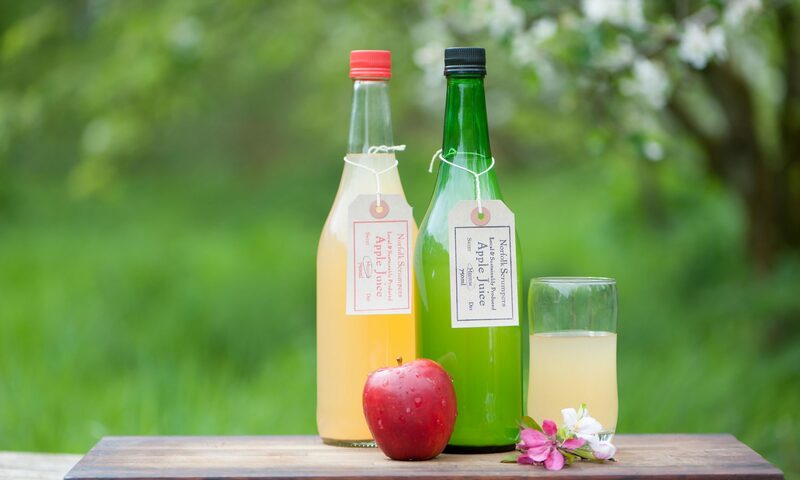 Our first customers have dropped of their apples and our bottles are on order. Please get in touch if you would like to book your apples in.